Tommy Nobis may be the only football player nearly recruited from outer space. In 1965, when he was drafted No. 1 in the NFL draft by the Atlanta Falcons and No. 1 in the old AFL draft by the Houston Oilers, Astronaut Frank Borman, command pilot of the Gemini 7 spacecraft, radioed word from space encouraging Nobis to sign with the Oilers. The message was relayed to Nobis, who opted to sign with the Falcons and became the finest football player in the franchise’s history. 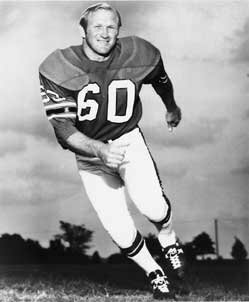 In his first season, 1966, Nobis was selected NFL “Rookie of The Year.” In 10 of 11 seasons with the Falcons, he led the team in tackles. He was selected to the Pro Bowl five times and chosen for the NFL’s “All Decade Team”for the 1960s. When you attended a Falcons game in the ?60s, you could be certain that the team would be outclassed at every position but linebacker, where Nobis was in a class by himself. When his team was trailing by 40 or more points, Nobis hit with as much devastation as if the game depended on it. Injured or not, Nobis played with intensity. He underwent knee surgery in 1969 and again in 1971 but he came back from both surgeries to earn another Pro Bowl spot in 1972. In one of the great miscarriages of justice, Nobis has not been selected to the Pro Football Hall of Fame. Whether he makes the Hall of Fame or not, he will be remembered as one of the great players of all time. He’ll also go down in the record books as someone who made life letter for others. Over the years he has devoted countless hours to the Special Olympics; he also founded the Tommy Nobis Center, which has trained thousands of disabled Greater Atlantans to earn their way in the workplace. Today, Nobis is Falcons vice-president for corporate development. He lives with his wife of 38 years, the former Lynn Edwards, in Sandy Springs. They have two sons, Tommy III and Kevin; a daughter, Devon; and two grandsons. A true family man, Nobis says his biggest thrill was not on the gridiron but being in the hospital delivery room when his children were born. Nobis was an All-American his junior and senior seasons and winner of both the Outland Trophy (best lineman) and Maxwell Award (most valuable college football player). His picture was on the cover of Sports Illustrated and Time magazines. He was the leading blocker and leading tackler on Texas? 1963 national championship and 1964 Orange Bowl championship teams. He not only was voted into the NCAA Hall of Fame and to the Halls of Fame of Texas and Georgia, he was also named to Sports Illustrated’s NCAA “All-Century” team. At the Falcons’ home opener next season, Nobis will be inducted into the Falcons’ “Ring of Honor” based on his incredible gridiron achievements. There ought to be a special award for him for elevating the disabled, enhancing their self-esteem and providing them with skills they can take to the bank.